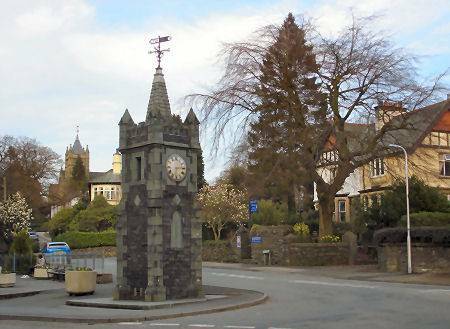 The small town of Windermere lies one and a quarter miles from Lake Windermere on its east bank. It was once known as the hamlet of Birthwaite. The town owes its development to the arrival of the Kendal and Windermere railway, the establishment of which was staunchly opposed by the poet William Wordsworth, who was concerned that the influx of visitors would spoil the natural appeal of the lake. Windermere gradually grew until it merged with Bowness-on-Windermere in 1905, although both retain their distinctive town centres. 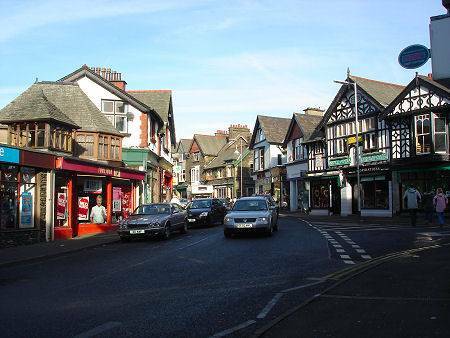 Windermere now hosts a population of around 2,295 people. Many of the town's Victorian houses now operate as guest houses. 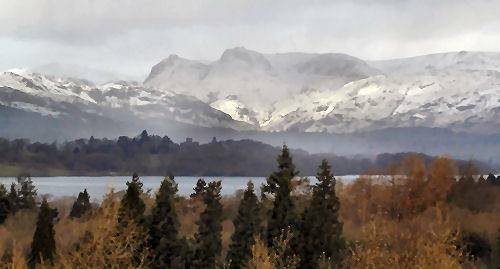 Windermere has many amenities, tourist shops, a large number of which supply fell walking and climbing equipment, a number of museums and a Tourist Information Centre, which is situated near to the station. Holehird Gardens, about a mile from the town, situated on a hillside on the southern side of the Troutbeck Valley, cover ten acres and are owned by the Lake District Horticultural Society. They host a superb collection of rhododendrons, azaleas and alpines. Among other features the gardens have an attractive rock garden, kitchen garden and an orchard. 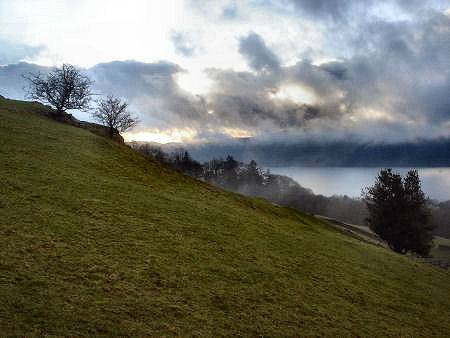 North of the town lies the fell of Orrest Head, at 784 feet, some excellent views over Lake Windermere can be had from its summit. On a clear day, the Yorkshire fells and Morecambe Bay are clearly visible. *Commencing at the station yard at Windermere town, proceed east through the car park of Lakeland Limited and turn left to walk up Thwaites Lane and then right for a 100 yards along the A road. Take the signposted gate on the right just beyond the farm. Continue ahead to climb a stile over a fence and pass through a gate. Beyond bear slightly to the left to cross a field to a kissing gate and then on to another. Still bearing left, take the stile that gives access to a path leading to the railway line. * Cross with care and descend to pass between garages. Bear left and proceed ahead, crossing roads where they swing left or right. Continue in the same directionalong a lane and pass over a small stone bridge. Turn right at a signpst and continue to pass through a kissing gate. * Turn left and proceed uphill keeping parallel with the wall on your left. Pass through a kissing gate in the wall at the top of the field and follow the path just beyond the gate to climb School Knott, which commands spectacular views. Descend to School Knott Tarn and bear round right keeping the tarn to your left. Continue to a kissing gate in the wall and bear left, uphill, to the top left corner, to pass through a gap in the wall. *Continue to the next waymark and turn left to reach a stile by Hag End Farm. Continue ahead keeping left of the barns and then right of the farmhouse to reach the access track to a narrow road. Turn left and after 200 yards take the signposted footpath across the field on your left.Climb the stile, turn right and walk beside the fence toa further stile, then descend the slope to a narrow road. *Cross the road and take the stile over fencing and continue beside the fence of the dwelling on the right, cross more fencing go over the access track and more fencing to bear right to a ladderstile over the wall on your right. Descend to a gate in the bottom left corner. Cross the tractor bridge over the ditch and continue toward the far right corner. Climb the stile over the fence and stepping stones over marshy ground. Continue to join the gated road to Ings. *After a 100 yards head left along a signposted path to a gate into Whasdike Wood. Emerge from the woodland and join a metalled road, at which you turn left. Continue ahead and pass through a gate and where the road swings sharply to the right, go ahead as directed by the signpost. Head for the small barn and climb a mound. The path then continues to a stile into School Knott Plantation. * Continue ahead through trees and onto open ground. to the skirt of School Knott, climbed earlier, from here retrace your steps to return.